Put your logo on our wide selection of Golf Tee Markers for your next golf tournament, event, outing or promotion. 4. Your Golf Tee Markers will be produced and shipped followed by a tracking number sent by email. 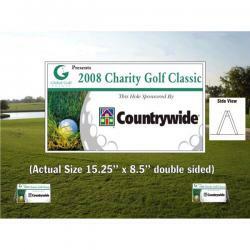 Charity Tournament Golf Tee Markers 15.25 x 8.5 - Golf Tournament Gifts..